Today, marketing specialist Matt Aird discusses a question that bedevils lots of authors when they begin their publishing journey. Are they marketing to sell their books, or to build their brand and platform? Here’s his report. As authors, we’re responsible for spending our advertising dollars and marketing time in the most efficient ways possible. We don’t have five- or six-figure advertising budgets, or a team of people working around the clock. We need to get maximum impact from every single dollar and minute we invest. What most authors might not consider however, is that there are two ways we can advertise. We can advertise to sell books now. Or, we can market to build an Author Platform. Every author has a platform. A platform is made up of the email subscribers and the social media followers that fit your ideal reader profile or put simply, the people that you can interact with that love to read what you write. Now the size and the engagement level of this platform has a massive impact on the success of any author. That’s because these platforms give us a foundation from which we can communicate and build meaningful relationships. So when we advertise we have two options, optimize our advertising campaigns and marketing activities to sell books now, or we can optimize our advertising campaigns to bring readers into our platform. We all follow at least one of these authors. These are the people that promote their books on Twitter relentlessly. Every second tweet is about their newly released title or a book they have discounted temporarily. Including a buy now link in every one of your emails to followers. Optimizing for book sales means your marketing efforts are centered on generating book sales above all else. The number one priority is to generate sales and royalties. Optimizing for your platform means you put generating income in second place. You’re instead more concerned with building a following of readers that you can communicate with outside of the books you write, typically through social media or email. Some examples of this approach. Instead of running a Facebook ad to sell books, why not run a Facebook ad to give books away? This way you can capture email addresses and communicate with these people for life. It’s also a great start to the relationship, and the recipient will be more open to communicating with you again. Instead of promoting your book every day why not share something personal with your readers? Why not send them a video you found funny or informative on youtube? Use this platform to build a connection. Advertising to build our platform is an investment in our long-term success. As an author, we need to come to the realization that there are very few overnight success stories in the literary world. The authors who achieve success are the ones that recognize it takes time to do so. These authors focus on bringing readers into their platform so that they become raving fans and buy everything they write, as opposed to just one title. For us to achieve this, we need to collect our potential readers’ email addresses and get them to follow our social media profiles. We then use these tools to interact with them in a way that fosters a connection. On the contrary, when we spend advertising dollars on selling books we’re hoping for an immediate payoff. We’re focusing on a short-term transaction instead of the process of building a relationship with our readers. Now, there is no doubt this strategy will result in a few more book sales upfront. Whether we use Facebook, Bookbub or Amazon Advertising or any of the many other platforms we have access to. The problem with this approach is that it does not lead to repeatable sales. We’ll see a spike in activity and then, as soon as the promotion ends, our sales flatline again. It’s like trying to stay up forever on coffee—you’ll do okay for a while, but eventually, you’re going to run out of steam. We want our potential readers to become emotionally invested in us as a person just as they would their friends or family. Once we achieve this we’ll have raving fans that will buy everything we write for the remainder of our careers they’ll write glowing reviews, and they’ll share our work with their friends. This is exponentially more powerful than trying to do all the promotional work ourselves. So next time you’re thinking about advertising or marketing, think not how you’re going to sell more books, but how you’re going to attract more fans. Playing the long game is always the best bet! Matt Aird is a writer for Koru House Media, a digital agency focused on helping self-published authors achieve success through better marketing. Access more of their free resources here. This is an issue I have struggled with. I like what you have said here. My problem: I am nearly tech illiterate and have no idea how to offer a free book/short story/novella/prequel on my website. This sounds like great advice but I have not found a site where anyone is listing the steps to do it. Right now I only have one book (Kindle format) on Amazon. Can this be done by saving the manuscript/document as a pdf file for the recipient to download? How do I develop a nice cover for it if it is not yet on the market? How to do this will vary based on the website service you’re using. Are you using wordpress, wix, squarespace or something else? If we get this info we may be able to walk you through the process of how to set this up. Thank you for this interesting and helpful post. You have expressed in words what I have been thinking. To borrow from the military: selling your new book is a short-term tactic, but selling yourself as an author, or as an interesting person, is a long-term strategy that can sell many books in the future. You need both strategy and tactics, especially if you write in multiple genres. The same person who buys your novel about albino amazon vampires may not care about your history book about the Lindbergh baby kidnapping, or a book of Jell-O recipes, but if you as an author and person have a powerful platform, you can appeal to buyers of all your books. REMINDER: Every book you publish should have a list of your other books. Ebooks can have links to them. 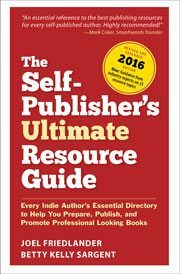 It may be worth the expense to periodically update your books so their lists are current. Great advice there Michael. The tip about links to your other books is a great one. The back of books should also give readers a way to connect with the author such as a link to a mailing list or social media profiles. You’re right these are such simple tactics to deploy but are still under-utilized by a lot of authors.